Did you know I love basics? It's true—I live in them. Jeans, T-shirts, simple (but amazing shoes), and classic outerwear not only make up the majority of my wardrobe but make up the bulk of my outfits both for day and night. Do you know what else I love? Making shopping for things I know our readers want exponentially easier than it already is. Because while perusing through countless websites and pages of products is pretty much my job (actually it is literally my job), I know that not everyone has the time. So much like I do every week with my roundup of the best new arrivals, today I'm bringing you all the best basics from some of my favorite sites, all in one place. 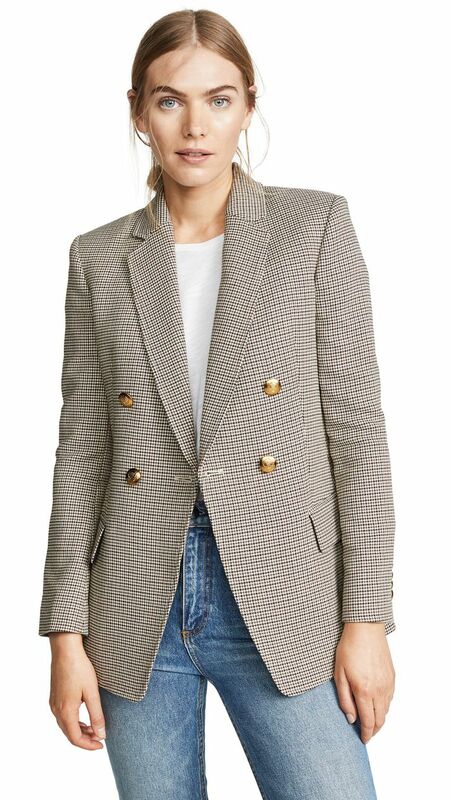 From the aforementioned pieces to skirts, tops, totes and more, there are so many amazing essentials on Shopbop, Nordstrom, and Net-a-Porter at the moment that I actually had trouble narrowing my favorites down to just 42. But I did, so to shop my top picks from each site, simply scroll down—and thank me later. You'll wear this for years to come. Style this with anything from T-shirts to sweaters to blouses. I have these sandals in black and wore them to death last summer. A good white blouse can be a wardrobe lifesaver. These can be the base of all your spring outfits. Vince has mastered pretty much all basics, but this one is particularly good. This season, try swapping some of your go-to black or white basics for something in of-the-moment baby blue. I think I found the perfect black one-piece. Looking for an easy pair of white sneakers you won't see all your friends wearing? This is it. If white jeans are your thing, this jacket has the perfect matching pair. Love a basic that's not basic. Meet your new work tote. How to wear black in the summer. It doesn't get better than a $15 white tee. The neutral shoe you'll want to wear with everything. Good black jeans are a wardrobe staple of mine. Now, that's a nice jacket. This season, bike shorts are the new leggings. A useful tote that's far from boring. The Line by K coming to Net-a-Porter is amazing news for all of us. This dress strikes the perfect balance between dressy and casual. I'm seriously considering adding these to my wardrobe. A midi skirt and sandals is my go-to spring outfit combo. Is it just me, or do these look particularly comfortable? You'll never need to take this classic necklace off. Cotton is the material you'll want in a blazer for spring and summer. The polished way to do shorts. Too pretty to pass up—the cheetah version is also calling my name. Nothing beats a good midi skirt. These will go perfectly with your all-beige outfits for spring. Pair it with strappy sandals and you're ready for anything. I love an atypical sweater. You can never have enough pairs of leggings. A non-boring wedding guest look you'll want to try this spring. I'll take a $10 tank any day. Block-heel sandals are a must for spring and summer. You're going to want the matching shirt. Am I the only one who considers a miniskirt an essential? Up next? My favorite basics that I actually own and wear all the time.